I’ve heard people say that romance and dating is dead. Is this really the case, or are we confusing good old fashioned techniques of meeting and speaking face to face, with flirting by text and showing emotion by emojis? According to research in 2017, the excitement and build up of getting oneself ready for a date, without involving a mobile phone, is just a thing of the past. Personally, I don’t really believe this to be the case and when I look around, I see love everywhere. It’s truly wonderful to see couples that have been together for decades, that still walk hand in hand down the street together, openly demonstrating that their love has simply blossomed over the years. Does it really matter how our relationships begin? Surely this is simply an insignificant detail, if our search to find someone that we can spend the rest of our lives with, is achieved? A few months ago, I received the most delightful email, from Gareth, a gentleman living in Hong Kong. He asked if I was able to help with an extra special request, for his girlfriend, Kate. 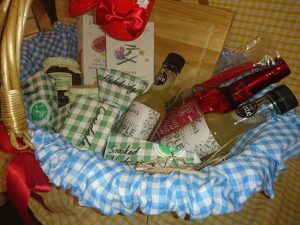 On hearing his ideas, I was only too happy to help with putting together a hamper basket, packed full of the delicious Cheese Deli produce, which he had carefully chosen. Kate has loved the story of the Wizard of Oz, since being a little girl. Originally from the Lake District himself, Gareth was bringing Kate over to Keswick during the Christmas period and he had something very special that he wanted to do whilst they were here – he had a proposal of marriage to offer Kate! 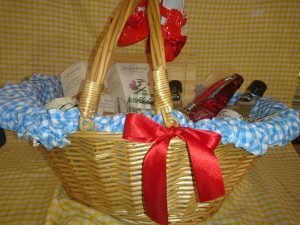 This was no ordinary proposal; a very thoughtful and exciting plan had already been strategically devised, requiring her to follow a trail around Keswick, collecting special and indulgent items from local shops and placing them in the hamper basket. On completion, their journey would end at Friar’s Crag, where he was to pop the important question to her. The hamper basket was delivered to the hotel they were staying at, in good time to start their trail; Kate, oblivious as to what lay ahead. 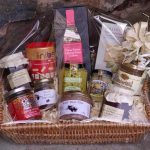 Obviously, this hamper needed to be lovingly put together and I wanted to make this one just that little bit more special. Did I go one step too far? I don’t think so, but you decide. Gareth and Kate were delighted with their themed hamper basket and set off, no doubt like Dorothy and one of her friends (not suggesting which one) along the yellow brick road, into Keswick town centre. Needless to say, the answer to the question of marriage, was of course ‘yes’. On hearing the news, everyone at the Keswick Cheese Deli was delighted to have been a small part of this lovely couple’s proposal plans and when the cat was out of the bag, it was wonderful to finally meet them both properly. Although the initial planning of this event did indeed require the use of social media, the most important part was carried out in a what might be considered a more traditional dating fashion. Many congratulations to Gareth and Kate; I wish them a very happy journey ahead together. 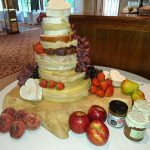 It’s just a shame that they live too far away, to help them with their cheese wedding cake! What fun I could have, decorating that with a Wizard of Oz theme! Romance is dead? Definitely not. Happy Valentine’s Day Gareth and Kate!